Wyatt Appleseth of Panorama controls his opponent during the Perry Invite last season. Appleseth was 3-0 in Truro Thursday. 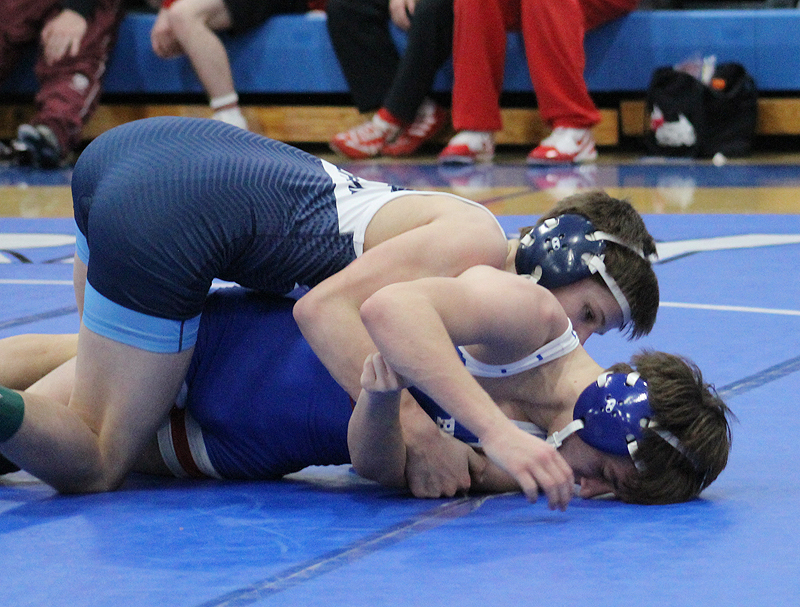 TRURO — The Panorama grapplers responded to a 55-12 loss to Van Meter/Earlham Thursday to post a 36-30 win over Southeast Warren/Melcher-Dallas before falling to host Interstate-35, 55-24, at a quadrangular meet. VM/E topped SE Warren/M-D, 56-15, and I-35, 45-22, with I-35 a 51-25 victor over SE Warren/M-D in the other duals at the event. Panorama and SE Warren/M-D were knotted at 30-all after 13 of 14 matches, leaving the 138-pound division to decide the dual. Panther grappler Jacob Holwegner delivered a team victory with a pin, in 53 seconds, over Bo Schneider. Holwegner was 1-2 at the quad but came through when most needed. Sixth-ranked 145-pounder Wyatt Appleseth was the lone Panther to finish 3-0 Thursday. He won twice by decision while scoring a pin against I-35. Garret Fox (170 pounds) was 2-1 with two pins, with Emry Colby (160) 201 with a pin and a decision while Noah Kirtley (152) was 2-1 with a pin and a victory in sudden victory I while Ryan Fees (132) was 2-1 with a pin and a forfeit. Logan Christe (113) and James Hein (195) were both 1-2 with wins by fall. Hunter Holmes (285) was unable to post a win in three bouts, with Josh Van Winkle dropping one match at 126 while the Panthers left 126 open twice. Panorama did not contest the 106, 120, 182 and 220 divisions in any of the duals.